Hot Off the Press: $10K Hole In One Prize Pays Off! Benje Dickey of Yorktown, Indiana scored himself $10,000, courtesy of hole sponsor Gary Demaree with Raymond James, Muncie Mission Ministries and Hole In One International. Dickey aced the 200-yard (wow!) 5th hole at The Players Club on June 7, 2012, during the 9th Annual Muncie Mission Golf Tournament. Check out our press release for further details. Are you a non-profit organization looking for more fundraising ideas? Hole In One International’s sister company, Odds On Promotions, can help! If you’re looking to make your tournament more rewarding, check out Odds On’s Golf Ball Drop promotion. You simply sell sponsorships by placing an individual’s name onto a numbered golf ball (other ball substitutes can also be used, such as tennis balls or even ping-pong balls). Then, drop all of the balls above a target via a helicopter, a cherry picker, or even a hot air balloon! If one of numbers on the balls closest to your target matches one of the balls on Odds On’s pre-selected list, Odds On will pay for the prize! Looking for more great fundraising promotion ideas? Check some of them out here on Odds On’s website. Or, if you have an idea of your own, feel free to give them a call at 888-827-2249 for a free, no-obligation quote! You can also email them any time. And congratulations again to Benje Dickey! We hope you’re having a grand ‘ol time spending that $10,000! Hole In One Leads to $35K White Gold Diamond Necklace!Hole In One Insurance Winner, Matt Kramarz! 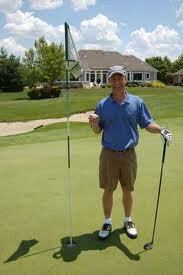 Home » Blog » Hot Off the Press: $10K Hole In One Prize Pays Off!